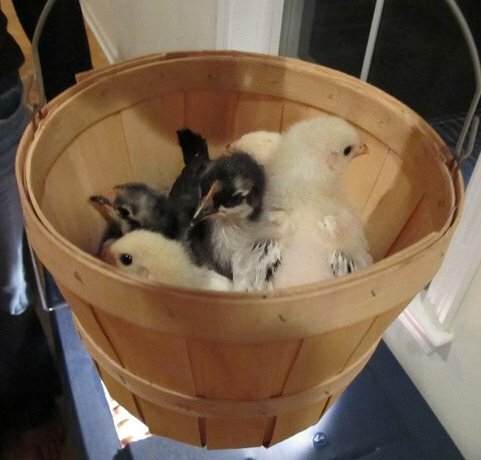 I have a basket of baby chickens. Your argument is invalid. So you’ve decided to commit to a more sustainable lifestyle, you’ve built a Pico-farm and are ready to stock it with a flock of happy, egg-laying chickens. Congratulations, you’ve reached the fun part. Before you go out and buy chickens, you need to ask yourself a few questions: do you want hens only, or do you want a rooster for breeding? Do you want to raise them from chicks or buy adults ready to lay? How big a flock do you want? But the most important question you need to ask is – Are backyard chickens legal in my area? Check you city, county, and state ordinances. You don’t want to invest time and energy into a flock that will be taken away from you. While your at it, talk to your neighbors. Make sure they’re ok with chickens. Promise them some eggs once they start laying. Even if backyard coops are illegal, there are ways around it. If you’re neighbors enjoy your flock, and the eggs you give them, they probably won’t call the police on your sustainable, educational, community enriching project. If you’ve been following along this blog and want to build yourself a Pico-farm, 4 chickens is the absolute maximum that can live comfortably in it, provided you don’t let the chickens range. If your yard is big enough that you can let the chickens out every day, and only lock them in the Pico-farm at night, you can probably get away with a bigger flock. In general, a rooster needs at least 15 hens to keep him busy or he’ll harass the hens too much. So for small flocks, a rooster is out (you’re neighbors will be pleased). Despite common belief, you don’t need a rooster to make hens lay eggs. What you really should do is spend a couple of days browsing Backyard Chickens, visit a someone local backyard flock, and spend a few weeks deciding if raising backyard chickens is really something you want to do. In general, pets should never be an impulse decision. I started my flock with day-old chicks. If you’ve rather buy old chickens, just skip the next few paragraphs. 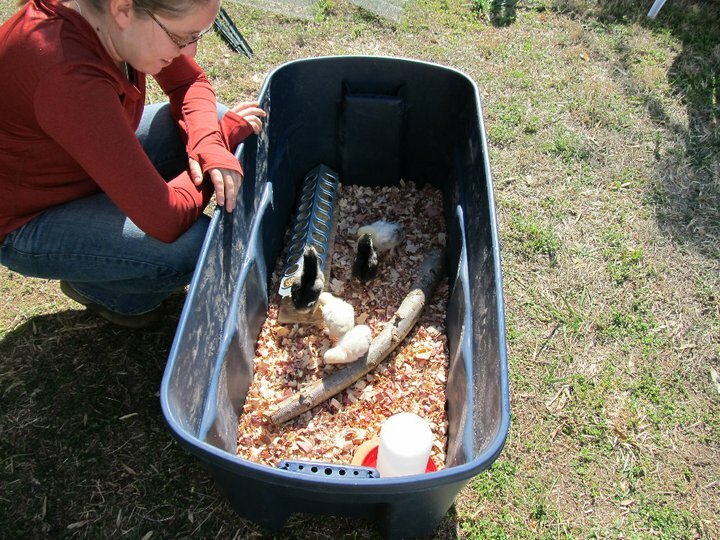 Before you buy chicks, make sure you have a nice, warm brooder set up somewhere inside and safe. Chicks need it very warm to survive. We used a utility light with a reptile heat bulb to keep everyone warm. You can tell if the chicks are too cold becuase they will become very loud and huddle together. Once you’re ready to buy some chicks, there are many options. You can find chicks on Craiglists, but we got ours from a local breeder, and later, from our local farm store. You can also order them through the mail from several large scale breeders. Make sure they have plenty of water and food they’ll grow shockingly fast the first few weeks. Depending on how big your brooder is, they can stay there for a couple of months. Once they’re fully feathered, you can move them outside to the Pico-farm. Vindaloo was our first rooster. It will take them a few days to get used to their new home, and you’ll probably have to pick them up and put them in the coop each night until they get comfortable going up on their own. Once they’ve settled in to their new home, your only duties are to guarantee that they have food and water. Chickens will stop eating when they’re full, so you can leave them with multiple days worth of food. Water should be changed every few days. Even if you’ve bought pullets, there’s still a chance that you’ve got a rooster in the mix. It will often be hard to tell when they’re young, but once they start crowing, you’ll know, and they’ll probably have to go. We tried to find someone to take our roosters (we ended up with three roos out of the first five chicks) but no one wanted them where we live. If you are going to get chickens, you either need to have someone ready and willing to take your roosters, or be prepared to take care of them yourself. I ended up slaughtering our three roosters, which is a very unpleasant option for many. If you have a small flock, a rooster may end up harassing your hens to death, so often keeping them is simply not an option. Once your flock is happy and established in the Pico-farm, you’ll find that they require very little maintenance. You need to check on their food and water everyday, check for eggs once they’re laying, and clean out their coop every month or so. You’ll discover that they’re not nearly as noisy or smelly as many non-chicken owner claim. If you’re coop does start to smell, it means that you need to clean it more often and if they do get very noisy, than something is stressing them out. You’ll also find that they’re far more entertaining than you originally expected. They have personalities, hierarchies, and strange quirks. I discovered that mine are absolutely terrified of logs. We put a big piece of willow in the run for them to play on and instead they huddled terrified in the far corner until it was removed. Chickens are a great educational tool for teaching children about ecology, developmental biology, and food awareness and an even better tool for teaching adults about sustainable living. With the right set up, a small flock requires about as much effort to maintain as a house cat, but, of course, house cats don’t lay eggs. While tempting, it's best not to bring your chicks into the office every day. Thanks! What a great way to get new chicks.